The Diocese of Miao has dedicated the Year 2014 as the Year of the Family. Bishop George Pallipparambil together with the Family Commission in the Diocese has drawn a Seven Points Agenda for a fruitful and meaningful celebration of the Year of the Family. Some Parishes in the Diocese Like the St. Xavier’s Parish, Lazu and Sacred Heart Parish, Kolam, had a very solemn inauguration of the Year of the Family. And other Parishes too had humble inauguration of the same in their respective mission stations. 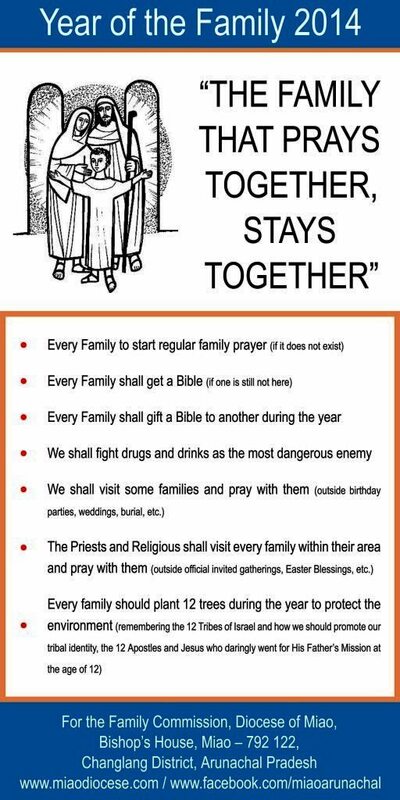 Every centre in the Diocese has planned various programmes to help every family to participate in the Year of the Family celebrations to become a visible sign of the Holy Family.